I’m pretty excited to get back on a training program but I’ve played around with the workouts a little bit to work with my personal schedule. I really prefer to do my long runs on Saturday as opposed to Sunday, but it is really more ideal to do pace work the day before the long run as opposed to after. Therefore, I decided to do my pace runs on Fridays, Long Runs Saturday and do the Rest or Easy Run days on Sundays. I also switched the “easy days” to Tuesday and Thursday since he suggests strength training those days and I like to go to my cardio / strength intervals class on Tuesday and Thursday during lunch. As far as yoga goes, my plan is stick with around 3 classes per week and focus more on stretching and core / upper body strength and less on killing my legs. Right now my half marathon PR is 2:08:01 (which is a 9:45 min / mile). I would LOVE to run a 9:30 min / mile average this fall (which would be 2:04:27). So that is what I’m going to use as my goal pace for my tempo / pace runs. I usually do 8:30 min / mile for my 5K pace and 9:00 min / mile for my 10K pace for speed work, but those are really just estimates (I rarely actually run 5K and 10K races). sounds like a very good plan. 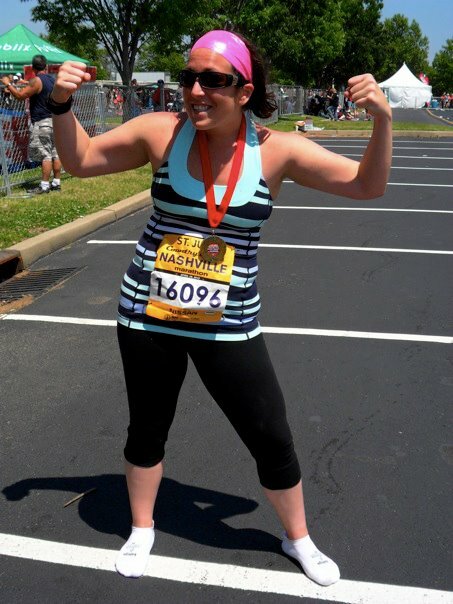 although I am not running marathons you motivated me to put a geared up fitness plan together for myself this fall. do you have any suggested websites for general excercise and strenght training that you like and would recommend? btw..when is the Baltimore Marathon – your fans want to be there.